Read 2 times. Last read March 21, 2018 to March 30, 2018. A fascinating way to write a book - different chapters by different authors. For all the difficulties that might imply, this book was coherent and exciting, and NOT disjointed as it might have been. It read more like episodic television with different screenwriters, or like a discussion where the speakers have different points of view and hence different input. The opening - an execution (and that is all I will say about that) - has to be one of the most compelling opening chapters I've ever read. And while that level of intensity is difficult to sustain, the rest of the book did not disappoint. With one caveat - Although the murderer's identity was inevitable, I felt a bothersome tickle that it could not have been even more original. However, the writing -characterization, overall plot, even the diversity of styles - made the book enjoyable, engaging, and hard to put down. 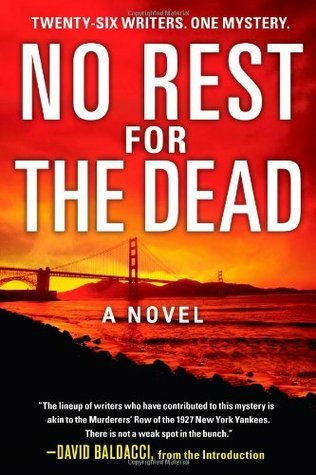 Sign into Goodreads to see if any of your friends have read No Rest for the Dead.